Britain's American colonies broke with the mother country in 1776 and were recognized as the new nation of the United States of America following the Treaty of Paris in 1783. During the 19th and 20th centuries, 37 new states were added to the original 13 as the nation expanded across the North American continent and acquired a number of overseas possessions. The United States is composed of many regions, areas with a common physical or cultural aspects. 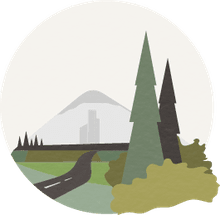 While there are no officially designated regions, there are some generally accepted guidelines for which states belong to which regions. A single state may be part of several different regions. For instance, you can assign Kansas as a Midwestern state and a Central state, just as you could call Oregon a Pacific state, a Northwestern state, or a Western state. Atlantic States: The states that border the Atlantic Ocean from Maine in the north to Florida in the South. Does not include the states bordering the Gulf of Mexico, even though that body of water may be considered part of the Atlantic Ocean. Eastern States: States east of the Mississippi River (not used generally with states that lie on the Mississippi River). Mid-Atlantic States: Delaware, District of Columbia, Maryland, New Jersey, New York, Pennsylvania. 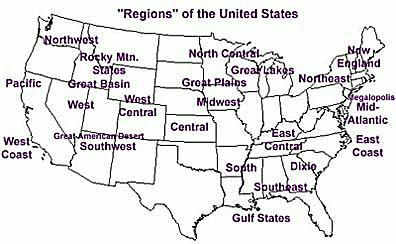 Western States: States west of the Mississippi River (not used generally with states that lie on the Mississippi River). The U.S. is part of North America, bordering both the northern Atlantic Ocean and the northern Pacific Ocean with the country of Canada to the north and Mexico to the south. The Gulf of Mexico also forms part of the southern border of the U.S.
Geographically, the U.S. is about half the size of Russia, about three-tenths the size of Africa, and about half the size of South America (or slightly larger than Brazil). It is slightly larger than China and almost two and a half times the size of the European Union. The U.S. is the world's third-largest country by both sizes (after Russia and Canada) and population (after China and India). Not including its territories, the U.S. encompasses 3,718,711 square miles, of which 3,537,438 square miles is land and 181,273 square miles is water. It has 12,380 miles of coastline.